Bluebird Lake is a 6 mile hike to an alpine lake surrounded by craggy peaks in the Wild Basin of Rocky Mountain National Park. Add an additional 1/2 mile spur trail to reach great trout fishing at Ouzel Lake. 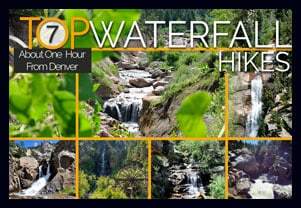 Hikers will enjoy panoramic views of the Wild Basin and the sites and sounds of several cascade waterfalls along the way. 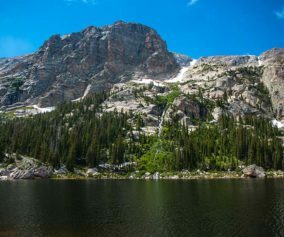 Wildflowers, waterfalls, and lakes await, so explore the full Bluebird Lake hike profile below for trail map, driving directions, and more tips and details to help you enjoy this adventure in Rocky Mountain National Park. With an elevation gain of over 2400′ over 6 miles of trail, the hike up to Bluebird Lake in RMNP is demanding, but not without its rewards. 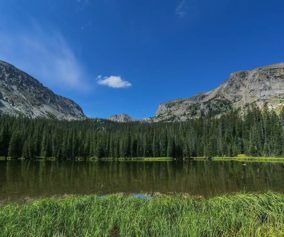 The hike to Bluebird Lake begins at the Wild Basin Trailhead, then winds through the central region of the Wild Basin, passing three cascade waterfalls along the way, and a fourth unnamed waterfall in the meadows above Ouzel Lake. The first waterfall on this hike is Copeland Falls, found 0.4 mile into the hike on this first, easy segment of trail. For details on accessing both the lower and upper leaps of Copeland Falls, check out our full trail profile for Copeland Falls. The trail continues west/southwest following North Saint Vrain Creek until it reaches the first important trail junction. The trail to the right leads past a series of backcountry campsites. These are reservable through the Rocky Mountain National Park Wilderness offices and make for a great place to stay for longer adventures into the Wild Basin area. The left-hand trail is the correct way towards the Bluebird Lake trail system and Bluebird Lake. Having taken the left-hand trail, the path soon crosses North St. Vrain Creek on a log bridge, one that recently was rebuilt to replace the bridge that washed out during the 2013 floods. An unnamed cascade can be viewed from the bridge area. Soon after the bridge, the trail meets with a second trail junction at Calypso Cascades. Taking the right-hand trail, the cascades (named after the purple orchids that grow along the creek) come into view. 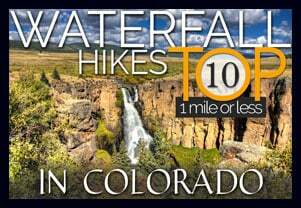 The path crosses a second bridge at 1.8 miles and begins a challenging climb as the trail weaves through a set of switchbacks up to Ouzel Falls at 2.7 miles. Calypso Cascades – Courtesy of Jeff Kramer. At 0.4 mile beyond Ouzel Falls, the trail comes to a junction with the Bluebird Lake trail; this is 3.1 miles into the hike, approximately half-way to Bluebird Lake. This new trail begins a steady climb up a ridgeline, through an area burned out by a fire that started from a lightning strike back in 1978. Yet the almost 40 years have brought some change to the landscape. Wildflowers decorate the hillsides, and new trees have come back and begun to establish themselves on the mountainsides. At 4.5 miles, there is a marked trail spur that leads to Ouzel lake. 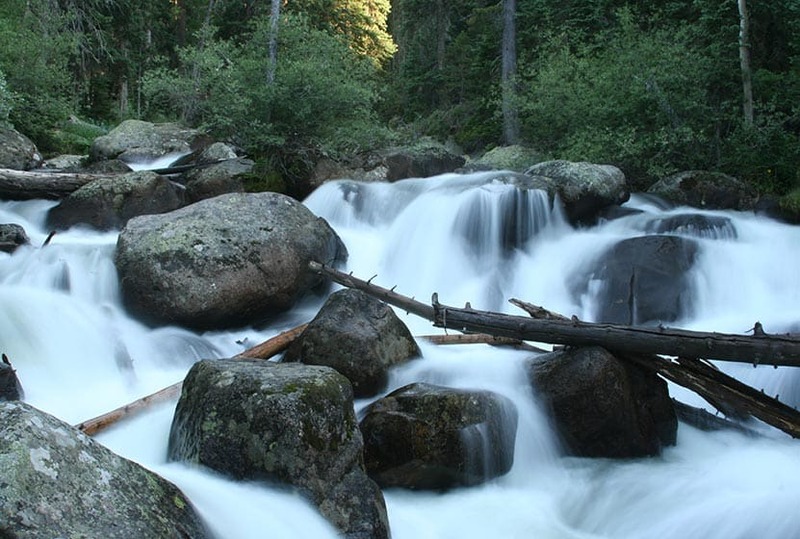 This 1/2 mile spur takes hikers to some of the best fishing in Rocky Mountain National Park! Of course, a Colorado State fishing license is required. A hike down this spur to Ouzel, will add another 1 to this hike to Bluebird, and it may be a good idea to visit Ouzel on the way back, after judging the conditions of the skies. 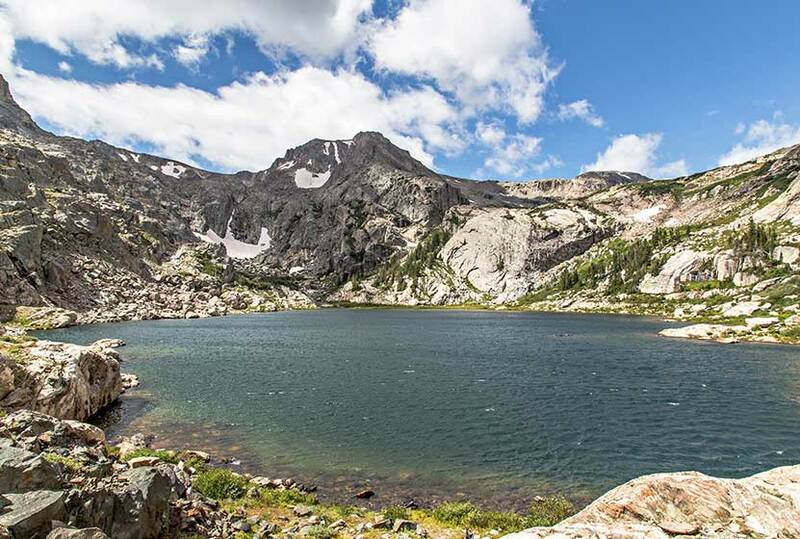 From the Ouzel Spur junction, Bluebird Lake is just 1.6 miles further, but 1000′ in elevation higher, making this part of the hike the most challenging. 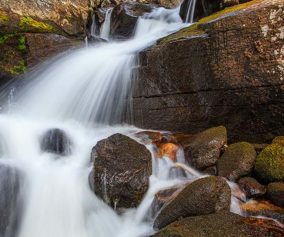 An unnamed waterfall can be viewed just in the meadows past Chickadee Pond (the small pond just past the trail Ouzel Lake trail spur). Crossing boulder fields and snow, the trail can be difficult to discern at times, and hikers can keep track of the trail by keeping a look out for cairns (stacked rocks marking the trail). Near the sign for the Upper Ouzel Creek campsite, the trail will cross Ouzel Creek and begin a very steep climb up to Bluebird Lake. Bluebird Lake does not have fish, but it makes up for it with the views, particularly the rugged face of Ouzel Peak in the southwest. Too Long of A Hike? 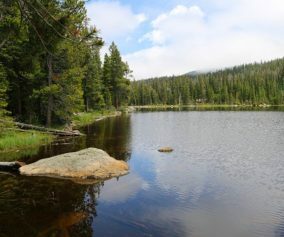 : Because this is a 12 mile round-trip hike–13 miles if you add in Ouzel Lake–it may be best to make this hike a part of a larger overnight adventure. Reserve one of the two backcountry camping sites along the Bluebird Trail to spend some time fishing Ouzel Lake and exploring the other destinations along the trail. Contact the RMNP Wilderness Offices to reserve a site. Summer Thunderstorms: If you see clouds with dark undersides building in the west, this means that thunderstorms are likely–a typical occurrence on most summer days. 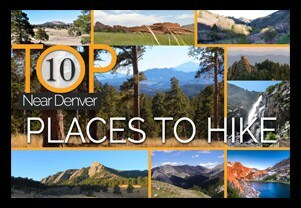 Begin hikes early to avoid storms and consider turning back if weather looks threatening. Photo: We would like to express our gratitude to Erik Wolf for sharing such an amazing photograph of this hike to Bluebird Lake in RMNP.